Putin’s Reich, like Hitler’s Reich, can be thoroughly surrealistic. Russia captured an Ukrainian army pilot, a well-known woman who served against in the Middle East. That an Ukrainian combat helicopter pilot ended in a cage in Russia is even stranger: did Ukraine invade Russia? No. Did Russia invade Ukraine? How else does Putin capture famous Ukrainian pilot (and then accuse her of “murder”). OK, 13 centuries ago, they used swords, not guns. The child is Christian Armenian in Syria. Armenia was the first Christian nation (early Fourth Century, more than 400 years before the invention of Islam by a raider called Muhammad). “Here a (nasty) question asked by Daniel C. Dennett in the book “Thinking” (2013) edited by John Brockman. And Dennett has introduced the question by citing William James’ The Varieties of Religious Experience (1902) with: “Far better is it for an army to be too savage, to cruel, too barbarous, than to possess too much sentimentality and human reasonableness”. Thanks Per, for mentioning Daniel Dennet, a well-known American philosopher, with a towering reputation, and this ineffable property of colossal boredom that seems to emanate from all American philosophers. Like a giant Black Hole at the heart of a galaxy, I need to swallow stuff, so I can make light. Dennet will do for now. The big mistake in World War two was to realize too late that Nazism had to be physically destroyed, with maximum savagery. The French Republic understood it: by January 1938, the French War Ministry launched a hyper secret NUCLEAR bomb program (Irene Curie, daughter of Marie, had not already a Nobel Prize, but she also had discovered the nuclear chain reaction, and taught it to Otto Hahn and Lise Meitner, both German, who, fortunately, had not understood too well what the much smarter Irene had found). The aim of the program was to atom bomb Berlin: Nazis were to get what they deserved (the project fled later to England, and then MANHATTAN, becoming the project by that name). Morality? Against those who have none, but the Dark Side, only darker ways win. The British followed the French example (Churchill of course knew about the nuclear bomb project): against the Nazis, only a deeper darkness would do. So they prepared a strategic bomber fleet. The idea was to eradicate Nazi cities, if it had to come to that. The British were ready for the worst. The British were ready for the worst, the Nazis were not: it would have meant, for the later, to look deep in their ugly souls. So they did not look. So they did not anticipate that they ugly souls would lead them to be at war, again, with France and Britain. Or, maybe in 1945 (some of them, including Hitler, planned, secretly). But not in 1939. Thus the Nazis did not prepare with a bomber fleet and enough anti-aircraft defenses. Britain did, because Britain anticipated the ugliness of what could follow: as the British soul was pure, it could look into the possible consequences of Nazi evil. So Britain prepared for the worst, all-out war (something the ex-director of Mi6 just suggested may happen with Putin). To fight evil, one has to draw the line somewhere. Thus, in 1939, Britain followed France, which had a defense treaty with Poland, and told Hitler that invading Poland was out of the question. Hitler, stuck, made his hyper secret alliance with Soviet dictator Stalin official. France and Britain, and Poland were undeterred. Poland refused to concede any territory for its Prussian tormentors who had occupied her for centuries. Hitler attacked. France and Britain declared war. At that point, it was clear Hitler had lost. It was just a matter of time. The Nazis tried to get lucky, and they were, in May 1940, after several inconceivable blunders by the French and British commands, who had not anticipated how insane the Nazis were. And Lady Luck was Nazi in May 1940. Why could not the Nazis reciprocate in kind? They had no (long range) bomber fleet. Their puny force was mostly wiped out in 1940. they had never anticipated they would find themselves in total war with Britain… While they were still unprepared. They had not anticipated that the French and the British would see all the way through their nasty Nazi souls and decided to do away with them, mustering whatever it took. Later the USAF joined, and the Nazis ran out of everything. Especially the capacity to make ammunitions, explosives, and fuel. Was it rough? Sure. But there was no other way to win the war. And if that war had been lost, the Nazis, in the end, would have simply killed most of humanity. That the ends never justify the means is cheap metaphysics. It’s a perfect metaphysics for slaves to have, if you are a master, as the servants will thus never revolt. In practice, metaphysics ought to never contradict physics. In the real world, absolute force is justified by absolute morality. Pointing guns at a toddler, and, or, gloating about it, is an absolute wrong. Chimps or simple monkeys, or even dogs would understand this (once they have been shown what guns can do). Not only is morality absolute, but, ethological research shows, it is shared among all advanced species. This is why dolphins rescue people at sea. It is also why dolphins do not attack people, although people do hunt, kill, and eat people in some parts of the world (I discovered that myself as a child in Africa; I have more to say on this another day). Why is the genus Homo so demonic? Well, it is a question of superiority. However, that sense of superiority, with its Dark Side can only be moderated with even greater force. God is not our friend, as it is just an illusion, and allusion, that primitives have. However, force, inflicted with enough demonicity, is all the god we need. One should go one cynicism further: the strength of the Islamist State has come from officers from Saddam Hussein’s army. Should one want to finish the conflict, one could make them an offer they cannot refuse. But then, of course, does not want to really finish that conflict? Situations develop an intelligence of their own, and conflicts are debates, at another level. When rats are pressed in a cage, they become vicious. We have been building a cage, and it has not become more comfortable. Belgium had, a little while back, 381 species of wild bees (crucial to the survival of the biosphere). Three years ago, it was down to 11, and a recent survey found only 5. What, or rather, who, is killing the bees? More on this later, and the connection with the world’s richest, and, according to himself, best man, the one who should pay no taxes, Bill Gates. Gates of hell are for those who make it so that too much power comes into too few hands. What do plutocrats want? In the common, all too restrictive sense of plutocracy as the “rule of money”, “plutocracy” is supposed to mean that plutocrats want their money to rule. Yet, plutocracy is not just about money. Even if one starts with “money”, one ends up with much more. Indeed, money is power onto others. By establishing charities, foundations, political financing, and other networks of influence, plutocrats extent invisibly their power beyond the horizon, and below the ground. However Homo Sapiens Sapiens not being made to be submitted to others “power”, we have there, in this will to quasi-infinite plutocratic power, a form of cruelty, not to say, mayhem. Power struggles kill, among chimpanzees. Notice that, with chimpanzees, even the alpha male has very little power: as soon as three of his subordinates gang up against him, he is toast. The same holds with wolves, or lions. But civilization is all about power. When only a few have its reins, they become like gods. At least in their minds, habits, ways, and means. That’s why plutocrats, their obsequious servants, and those they have hypnotized, worry so much about “us living within our means”. A Few Guys Have ALL The Power, What Could Go Wrong? Whereas a modern bureaucrat, like Eichmann, can send millions to death. Some will say the analogy is in poor taste. But not so. People such as Obama, Hollande, Putin, can literally launch actions that, in the worst possible case, could lead quickly to the death of billions (it takes just one 300 kiloton thermonuclear bomb to destroy most of any city on Earth). I do believe that so much power, in so few hands, in so few brains, is not just immoral, but unwise. This makes civilization highly unstable. However, a meta-discourse has been held, not just logically, but emotionally: it is OK to have so much power in so few hands. Let’s put aside the main problem aside. The main problem being that absolute power corrupts absolutely, and that Czar Putin, for example, has more power than all the Czars who existed before him, put together: it’s not just that Stalin, had no H bombs. Both him, and Brezhnev, were worried by the Politburo (their top communist colleagues). Putin, by comparison reigns on a coterie of obsequious plutocrats, anxious about Polonium in their tea, or homicide by heart attack. Not that Putin needs to give a direct order. For someone who can roughly kill half of Chechnya, and then get away with offering luxury homes there to his gregarious friend the “star”, not to say czar, Depardieu (not prosecuted for war profiteering, whereas the French government prosecutes commoners for basically nothing, commonly), letting it known to its secret services subordinates that he would love it if contradictors could just vanish, is elementary. An aside here: when top official of the Nazi administration asked Adolf Hitler directly whether there was a systematic policy in place for killing Jews, Adolf Hitler firmly denied there was. At the Wannsee Holocaust conference, top Nazis confronted SS General Heydrich, and told him that Hitler had personally told them that it was not the policy of the Reich to kill the Jews. And they felt sure that, should they ask Hitler that same question again Hitler would give the same answer. If A Few Guys Can Fry Us All, Why Can’t They Own Us? If it’s OK to risk thermonuclear Armageddon with a few morons in control (for vicious moron, consider Putin), why is it not OK to risk an economic apocalypse, let alone a climate apocalypse, with even more morons in control? Is it not more… democratic? If Obama has too much power, does not giving ever more power to the Koch Brother, Bill Gates, and the Z guy from Facebook counterbalance that? In any case, bleat the sheep, if plutocrats have all the power, they take all the decisions, and we can rest. So, indeed, we have to ask again, what do plutocrats want? What train of evolutionary thought do they come from? Well, simply the cruel streak which leads to extermination. The main problem of man has been man. For millions of years, being the top predator. It is not “austerity for austerity’s sake”, Patrice. It is simply the principle of “living within one’s means”. NO COUNTRY IN EUROPE IS DOING THIS. The idea that “ending austerity” is the solution is risible leftist claptrap. It is the failure to live within our means that has led to this as politicians at all levels either bribe voters with the latters’ own money, or in the case especially of Italy and Greece simply steal it. If it were just Italy and Greece, we would be safe. Stealing from politicians is a worldwide phenomenon. The son of the preceding (“socialist”) president of Senegal, found himself with a fortune of more than a billion dollars. After a change of president, judges put him in jail, in the hope of finding out where the money came from. Senegal is one of the world’s poorest countries (having no resources of any sort, but for fish devoured by Korean factory ships, which, I am sure, paid very well; the fish came back after the new president asked the Koreans to pay, and the French empire lent a military jet which takes pictures). “Living within our means” sounds good, but a sovereign country is not a family (contrarily to what Obama said). The money within a country is not a store of value (only gold reserves are; most countries got rid of them). Instead, money enables the population to do a number of things. If there is not enough of money around, these things cannot be done. Moreover, money, like blood, has to circulate. However, it’s not doing that anymore, as the wealthiest store it, and have less use for it than the lower classes. Take the case of France. Suppose France borrowed a trillion Euros on the free market, at the present rate of less than 1%. Investors, in their despair, are ready to lend to France at that rate, on the ten year bond. Such a borrowing would allow the government to augment enormously its spending: it could pay for the best universities in the world (as China is presently trying to do), it could finance all sorts of fundamental research, it could even fabricate large Thorium reactors, with the whole economy to go with them (mines in Brittany, U 233 breeders, etc.). Presto, no more energy and CO2 crisis, and reactors which could be sold worldwide. The pessimist would bemoan that we cannot afford it. Of course we can: it would cost, nothing. Hopefully, inflation, over the next ten years, will be 1% per year, entirely cancelling the interest payments. Higher inflation, though, would devour the principal. Is this all fancy? 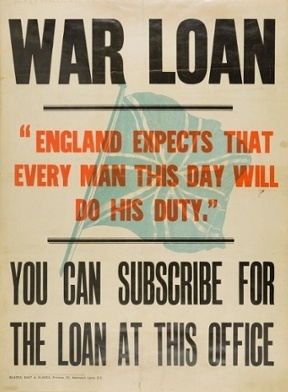 Today the Chancellor of the Exchequer (Britain’s finance and economy minister), G. Osborne, announced that Great Britain will, finally, reimburse its First World War debt. How? By borrowing at 4%, the lowest interest in Britain for a very long time. Actually it’s even better than that: some of the debt to be repaid comes from the Crimean War, the wars against revolutionary France, and even the South Sea Bubble (three centuries ago). It is even better than that: The Bank of England, the world’s first central bank, was created to support the Royal Navy. Basically, if the Navy needed money, the Bank would print it. That was put to good use a century later. France was much larger economically, economically, not to say intellectually, than Britain, so fighting the French superpower seemed ridiculous. However, as France was in the way, this is exactly what Britain did in 1756-1815. Paying Prussia as an attack dog, creating a huge Navy, etc. Famously, confronted to the invasion of Francia by the Arab, Syrian, Berber, and generally hysterically Muslim armies, and navies, in 721 CE, the Merovingian government of Prime Minister (and effective head of state) Charles Martel, just nationalized the Catholic Church, selling its precious metals, and stones. That method is more available, the more plutocrats there are. Osborne (out hero of the day, the conservative plutophile who heads things financial in the UK), spoke yesterday of introducing a “Google Tax” of 25%. Says the Guardian: “Responding to outrage about the minimal contributions big corporations make to European governments, the Treasury is targeting Silicon Valley companies such as Google, Amazon and Apple, but the measures will reach beyond technology to high street chains such as Starbucks. “We will make sure that big multinational businesses pay their fair share,” assured Osborne. That will not be easy: one is talking here about what some view as the richest criminal enterprises in the world. Having plenty enough of money to accomplish important work, is pretty much how the West went through the 30 glorious years of strong economic expansion after World War Two. In practice, though, debt can be reduced by taxing the wealthy. Why to borrow from the rich, when one can tax them? Well it all depends if one lives in plutocracy (borrow), or in democracy (tax). Under general-president Eisenhower, the wealthiest were made to contribute (Ike used his 93% upper margin tax rate; it was of course the same in Europe). That’s how to live within the better means we could create for ourselves. This means, first, defanging what, and those who, have too much power, be it thermonuclear, political, economic, or even ideological. Democracy is not just a way of life, but the way to survival… Just what the cruelest, and fiercest instincts do not want.